This Golf Handicap Calculator will quickly calculate your 18-hole or 9-hole index and course handicaps. You can enter adjusted gross scores, or use the built-in hole-by-hole form to add up your score while adjusting for your Equitable Stroke Control maximum. Plus, you can enter rounds in any order, saving you from having to re-enter the same rating and slope multiple times. And, you can also choose to enter and save courses and tees to make future calculations even faster. And finally, the calculator includes a printer friendly handicap report that you can submit to tournament and league organizers. How to calculate golf handicap. Calculate your 18 or 9 hole golf handicap index and save your rounds, courses, and tee ratings and slopes between uses. Select either Male or Female. The calculator will use your gender to establish your maximum handicap should it be needed. If you will be entering hole-by-hole scores, the calculator will use this range to display the estimated maximum score on any hole based on your selected range. If you won't be entering hole-by-hole scores, the calculator will ignore this setting. Tap the plus (+) icon to show the course entry form. This is an optional feature that allows you to enter the courses you play, along with the rating and slope for each tee. Your courses can then be saved using the Save feature under the Data tab. Select "New Course" from the drop-down menu. Indicate whether it's an 18 or 9 hole course. Enter a color, rating, and slope for each tee you expect to play (you can leave other tees blank). the "Add Course" button. This will add the course and its tees to drop-down lists for entering rounds. Select the course you wish to edit from the drop-down menu. Select the course you wish to delete from the drop-down menu. Note that editing or deleting a course will not be reflected in any scores you have already entered. So if any scores will be effected by the action, you will need to delete the effected rounds and re-enter them. Enter the course rating for each of the tees you expect to play from. Course ratings are usually listed on a course's scorecard, and typically range between 67 and 77. Enter the course slope rating for each of the tees you expect to play from. Course slope ratings are usually listed on a course's scorecard, and range between 55 (easy) and 155 (difficult). If you have added courses in the above section, select the course you are entering a round from. If you selected a course, select the Tee you played from. Enter the date the round was played. Enter the course name, rating, and slope. If you selected a course and tee, these should be filled in for you. Select either Total Score or Hole By Hole. If you selected Total Score, enter your Adjusted Gross Score (AGS, see the Learn section for adjusting your score according to the "Equitable Stroke Control" guidelines). If you selected Hole By Hole, enter your score for each hole, adjusting each as necessary. The golf handicap calculator will add up your scores as you enter or select them. Repeat for each round you wish to enter. You will need to enter at least 5 rounds in order to calculate your handicap index, and your rounds can be saved using the Save feature under the Data tab. If you see a mistake after entering a round, you can delete if from the rounds list and re-enter it. Select either 9 holes or 18 holes. 9 hole rounds: If you select "9 holes", and the course you played is a 9-hole course, enter the rating as provided by the course. Otherwise, if the 9 holes were played on an 18-hole course, and you didn't add the course to the calculator, manually divide the rating by two and enter it above. If you added the course and tees to the calculator, the calculator will divide the rating by two for you when calculating your 9-hole handicap from 9-hole rounds played on a 18-hole courses. Select either "Total Score" or "Hole By Hole". Total Score: If you select "Total Score", enter your adjusted gross score for the round in the field provided. Hole By Hole: If you select "Hole By Hole", the calculator will display an 18-hole form, along with an option to enter the hole scores using either a keypad, or drop-down menus. In either case, the calculator will add up your total score for you as you type or select your hole scores. Be sure to adjust any scores that exceed the maximum established by the following Equitable Stroke Control chart. This is your estimated handicap index based on the number of scores you have entered. The number of differentials ([[score - rating] x 113] / slope) used to calculate your handicap is based on the following chart. If you entered more than 4 9-hole rounds, this is your estimated 9-hole handicap index based on the number of scores you have entered. Optional: Select your gender if there's a possibility your calculated handicap could exceed the maximum. Optional: If you will be entering hole-by-hole scores, select the course handicap range to use for adjusting scores that exceed the maximum allowed. Optional: If you want to save courses, tees, slopes, and ratings for your use, expand the Course Add/Edit form and enter the courses and tees you anticipate playing. Optional: If you expect to enter more than 20 rounds, enter the date of the round you want to enter. Enter the course name (optional), rating, and slope for the round you are entering. Select 18 Holes or 9 Holes. Select Total Score or Hole-By-Hole. Enter the score(s) and click the "Enter Round" button. Then repeat steps #4 through #8 for each round you wish to enter. If you want to save your rounds, courses, and tees for your next use, click the "Data" tab, enter a name, and click the "Save" button. 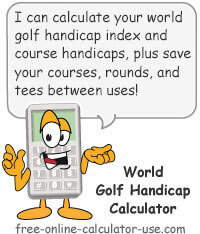 How to calculate your handicap index, handicap differentials, and course handicaps. In order to calculate your handicap index, you will need a minimum of 5 golf scores (20 is ideal). Once you have 5 golf scores, you will then need to adjust those scores based on the maximum hole scores as stipulated by Equitable Stroke Control. If it helps I have included the following golf handicap differential calculator. Sum the lowest differentials and divide by the number of differentials used. Multiply the average differential from step #4 by 0.96 and drop any decimals after the 10th place. For example, if the result of multiplying the average differential by 0.96 is 12.234, your handicap index would be 12.2. The maximum handicap index is 36.4 for men, and 40.4 for women. So if your calculated index exceeds your maximum, use the maximum as your index. For a more detailed explanation of the golf handicap system and its intricate details, please visit the USGA Handicap System Manual.